The Power of "Yes, And!" “Yes, but…” Two simple words that are so easy to say that most people respond with them automatically. The problem is that “yes, but” is the fastest way to annoy customers, miss sales opportunities, alienate and demoralize team-members, and keep yourself stuck at your current level. 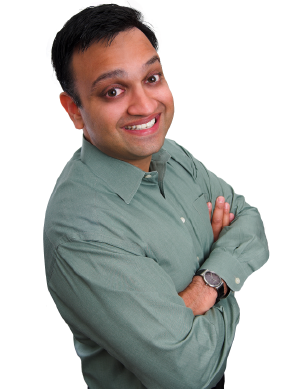 In this high-energy, hilarious, and interactive keynote, professional speaker and motivational improviser Avish Parashar will use ideas and exercises from improv comedy to show you how and why to make the simple and profound shift from “yes, but” to “Yes, And!” so that you can improve service, delight customers, improve teamwork, and unlock your own untapped potential! Plan to attend the whole conference to hear all of Avish's message. * Member registration is $125 for the whole conference. Avish Parashar is an energetic and humorous speaker who uses his 20+ years of experience performing, teaching and studying improv comedy to show organizations and individuals how to deal with the unexpected quickly, effectively, and with a sense of humor. Avish is the author of "Improvise to Success!" and the Amazon best-seller, "Say 'Yes, And!'" He has also created dozens of other products on applying improv skills to business and life. Avish graduated from the University of Pennsylvania in 1995, and worked in IT for seven years. While working “normal” jobs, he created, managed, and directed Polywumpus Improv Comedy from 1996-2002, and then performed, taught, and directed improv with Full Circle Theater from 2002 to 2008. In 2003 Avish launched his speaking and training business. Combining his experience in improv comedy and his experience working in a variety of environments, including a Fortune 500 company (Chase Manhattan), a small family-run business, and an internet startup, Avish created a unique, entertaining, and relevant approach to speaking and training.